School and tour buses may park on Walnut Street directly west of the Capitol in the specially marked area for free. Visitors will not be able to enter the Capitol via the west entrance throughout the duration of the Capitol Infrastructure Upgrade Project (2017-2019). 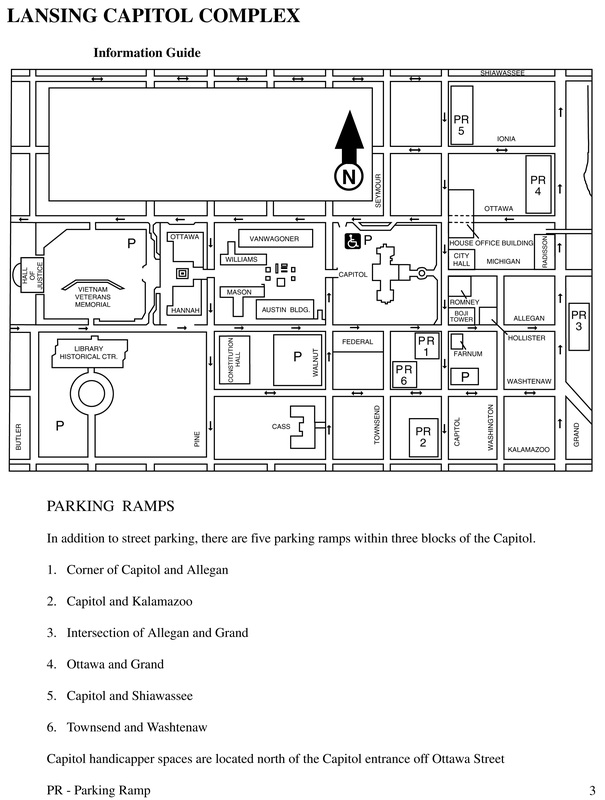 Visitors coming from Walnut Street or the Capitol Complex Mall will need to use the south (Allegan Street) sidewalk and enter the Capitol via the east (front) entry. 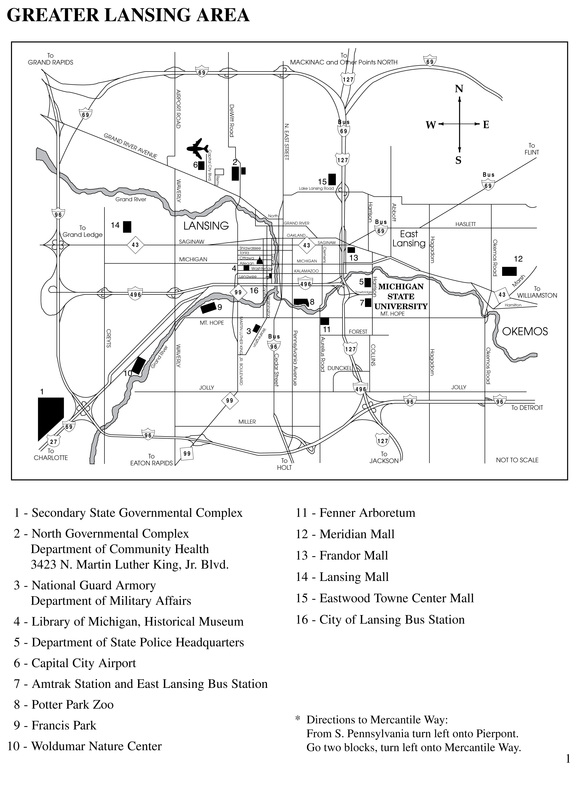 School tours coming from the Michigan Historical Museum or the Hall of Justice are encouraged to transport students to the Capitol by bus and drop them off on Walnut Street in the marked “School Bus Parking” area. Buses may also park for free at the Michigan Historical Center in the south parking lot between Washtenaw, Butler, Kalamazoo, and Sycamore Streets. The entrance for the parking is located off Kalamazoo Street, three blocks north of the I-496 expressway and two blocks east of Martin Luther King Jr. Blvd. (M-99). If you have questions regarding parking and access to Capitol entrances please contact the Capitol Tour and Information Service at (517) 373-2353. 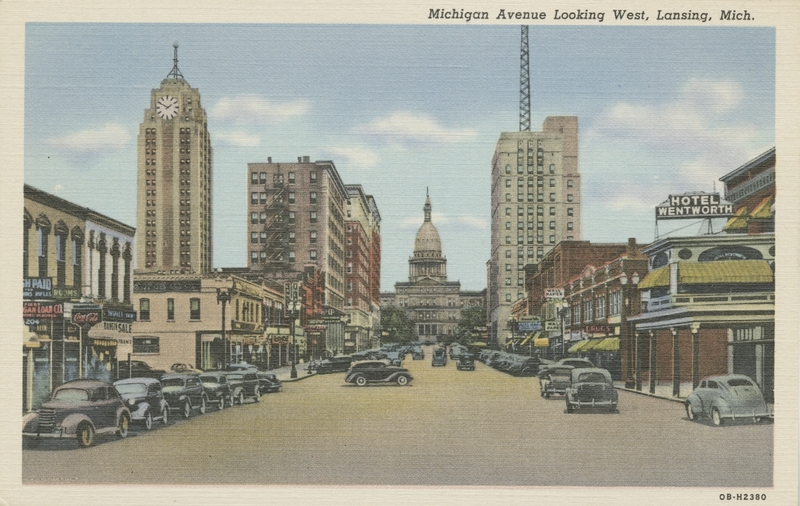 The Michigan State Capitol, seen from Michigan Avenue in downtown Lansing c. 1950. 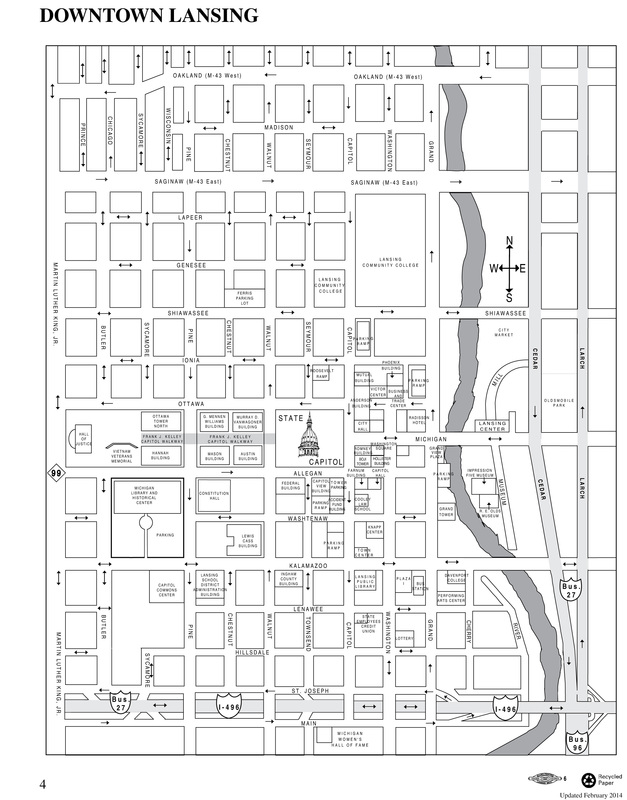 Metered parking for cars, trucks, and vans is located on the streets surrounding the Capitol. Various meters allow between one and four hours of parking at the rate of $1.25 per hour. Meters accept coins only. 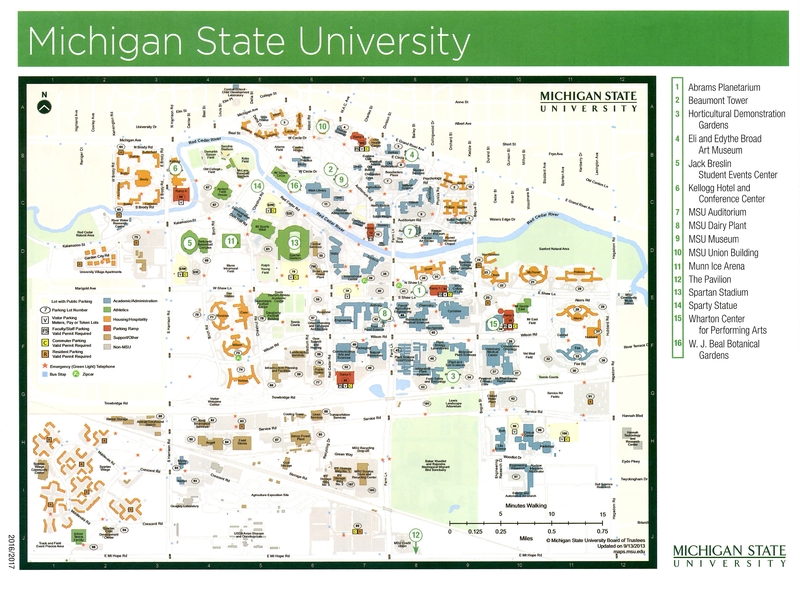 Personal vehicles may park for $1.00 an hour at the Michigan Library and Historical Center in the south parking lot between Washtenaw, Butler, Kalamazoo, and Sycamore Streets. The entrance for the parking is located off Kalamazoo Street, three blocks north of the I-496 expressway and two blocks east of Martin Luther King Jr. Blvd (M-99). Parking fees are paid at the entry/exit gate by credit card only. 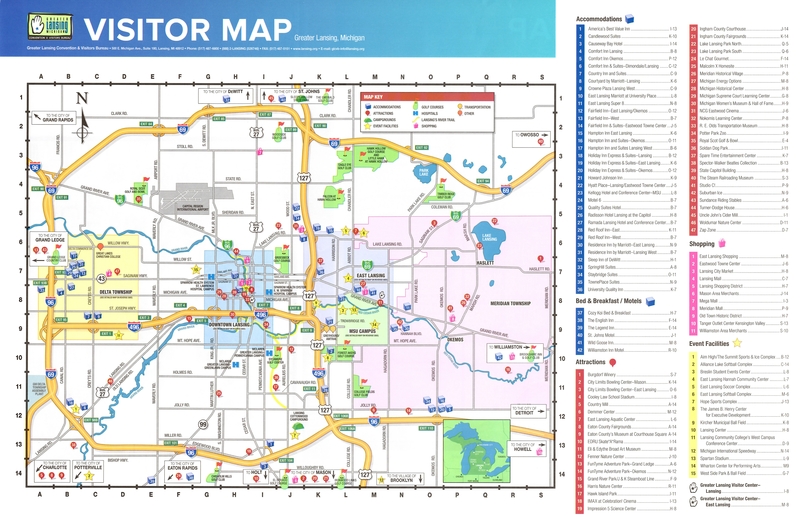 On weekends, free parking is available at meters on any city street, or at the Michigan Historical Center in the south parking lot between Washtenaw, Butler, Kalamazoo, and Sycamore Streets. The entrance for the parking is located off Kalamazoo Street, three blocks north of the I-496 expressway and two blocks east of Martin Luther King Jr. Blvd (M-99). 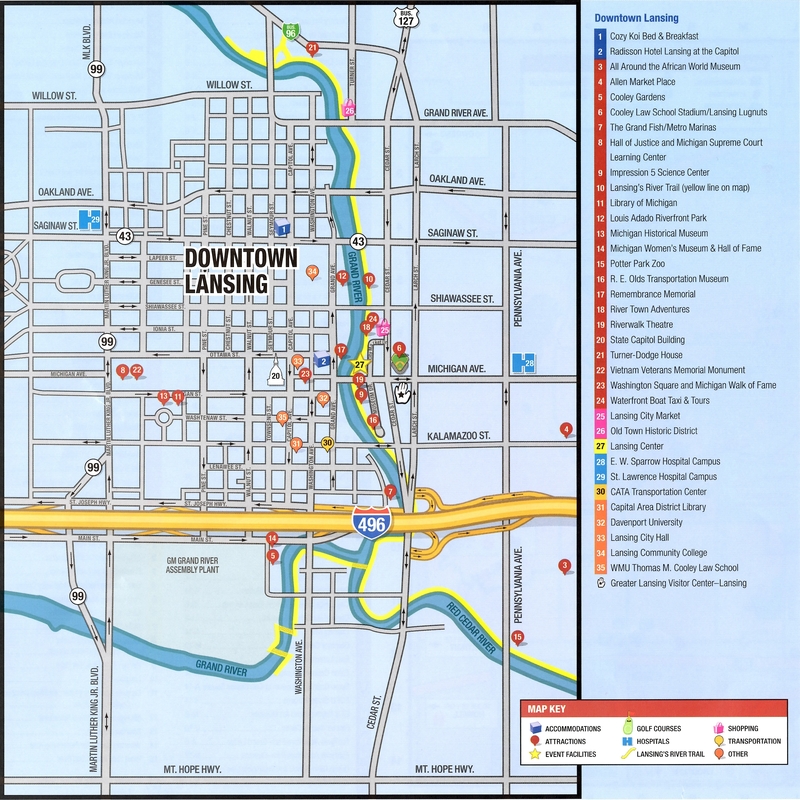 Parking for people with mobility disabilities is available free of charge at any City of Lansing metered parking space. Vehicles must display either a mobility disability license plate or a mobility disability permit issued by the Secretary of State. Follow M-32 west to I-75 south. Take I-75 south to US-127 south. Take US-127 south to I-496 west. Follow I-496 to Pine/Walnut St exit and then follow Walnut St. (one way going north) to Allegan St. Turn right onto Allegan St. (one way going east). The Capitol is on the left. Follow I-96 west to US-127 north. Take US-127 north to I-496 west. Follow I-496 to Pine/Walnut St exit and then follow Walnut St. (one way going north) to Allegan St. Turn right onto Allegan St. (one way going east). The Capitol is on the left. Follow I-69 west to US-127 south. Take US-127 south to I-496 west. Follow I-496 to Pine/Walnut St exit and then follow Walnut St. (one way going north) to Allegan St. Turn right onto Allegan St. (one way going east). The Capitol is on the left. Follow I-96 east to I-496 west. Follow I-496 to Pine/Walnut St exit and then turn left onto Walnut St. (one way going north). Take Walnut St. to Allegan St. Turn right onto Allegan St. (one way going east). The Capitol is on the left. Follow M-28 east to M-123 south. Take M-123 south to I-75 south. Continue on I-75 south to US-127 south. Take US-127 south to I-496 west. Follow I-496 to Pine/Walnut St exit and then follow Walnut St. (one way going north) to Allegan St. Turn right onto Allegan St. (one way going east). The Capitol is on the left. From Mt. Pleasant: Follow US-127 south to I-496 west. Follow I-496 to Pine/Walnut St exit and then follow Walnut St. (one way going north) to Allegan St. Turn right onto Allegan St. (one way going east). The Capitol is on the left. Follow M-37south to M-113 east. Take US-131 south to M-115. Continue on M-115 and merge onto US-10 east and then onto US-127 south. Take US-127 south to I-496 west. Follow I-496 to Pine/Walnut St exit and then follow Walnut St. (one way going north) to Allegan St. Turn right onto Allegan St. (one way going east). The Capitol is on the left.